In Spring 2016, 612 students have maintained at least a 3.50 grade point on a 4.00 scale while enrolled in at least 12 semester hours of classes and have been named to the President’s Honor Roll. The 2016 commencement exercise held at Dakota College at Bottineau marks the 110th graduation ceremony conducted by the college. Dakota College at Bottineau opened in 1906 as the North Dakota School of Forestry. Graduates received diplomas in the fields of health care, web design, information technology, wildlife along with liberal arts. One-hundred seventeen students were candidates for their associate degrees, diplomas, and certificates and over half were in attendance for the event. The Admissions Office at Dakota College has two new employees, who both started their new positions during the week of June 6th. Mike Greene has accepted a dual role as Admissions Counselor and Baseball Coach at DCB. Mike is originally from Seattle, WA. He has twenty-five years of coaching experience from the t-ball to the pro-ball level. He previously coached a professional baseball team, the Douglas Diablos and has been the head baseball coach at the high school and junior college level as well as assistant coach at the Division I and II collegiate levels. Beth MacDonald is the new full-time Admission Counselor at Dakota College at Bottineau. Originally from Devils Lake, ND, Beth understands the important role of small communities and small colleges and the opportunities they contribute to being a successful student. She completed thirty-one credits in high school through the dual credit system and completed her Bachelor of Arts in Psychology in three years at the University of North Dakota. Renovations to the Nelson Science Center’s heating,ventilation and air conditioning systems are well underway this summer. Through this project, essentially all of the equipment in the building’s mechanical room is being replaced and updated with new technology. Additionally, ventilation upgrades will be occurring in the Center’s chemistry lab, electrical panels will be replaced and the building’s restrooms will be updated. This project is funded by an appropriation of approximately $1,050,000 which was approved during the 2015 legislative session. T.F. Powers Construction Co. of Fargo is providing construction management services and Hepper Olson Architects, Ltd. of Buxton is the architectural firm for the project. Starting with our enhanced New Student Orientation this year, we are piloting a Shared Advising Model which the majority of academic departments have elected to participate with. An Academic Advising Center was denoted, co-located within the Academic Success Center (ASC). Two ASC staff are serving as full-time advisors, and three staff are serving as part-time advisors – all of whom are working with freshmen, sophomores, undecided, Bachelor of Universities Studies (BUS), Associate of Arts and online students. The advisors work closely with the Department Chairs to review program entrance criteria, curriculum updates and course rotation updates, to ensure students receive well-rounded, fully informed program information. Moving forward, students will transition to a Content Academic Advisor in their major field of study when reaching specific milestones, such as declaring a major or accumulating a specific number of credit hours. Dr. Thomas Mitzel, president of Dickinson State University (DSU), was invited to speak at Economic Development Association of North Dakota’s (EDND) 2016 summer conference being held Wednesday, June 22, in Bowman. The conference, hosted by Bowman County Economic Development Corporation and EDND, brings together economic developers from across the state to participate in educational sessions, networking and the exchange of ideas. The theme of this year’s conference is “Live to Lead, Lead to Achieve.” Mitzel’s keynote address will emphasize the importance of demonstrating strong leadership in challenging times as well as education as a partner in economic growth. In March 2016 the DSU Heritage Foundation began the Centennial Campaign with the intention of raising funds for student scholarships at Dickinson State. The Centennial Campaign consists of two smaller campaigns, the Cornerstone Traditions Scholarship Campaign and the College on the Hill Endowment Campaign that are also eligible to receive a match from the State of North Dakota of $1 for every $2 that are donated. The numbers of lives touched by Lake Region State College the past 75 years is hard to measure, so it’s only fitting that to celebrate its 75th anniversary, Lake Region State College is inviting the entire community and region. We’ve always considered ourselves a true community college…a community college by mission and a community college because it’s the community’s college where citizens can participate in arts, theater, sporting, lectures and other special events, said Dr. Doug Darling, LRSC President. Special activities commemorating the anniversary will be held July 7-9 including a 7.5 K walk/run, golf tournament, open house and picnic. A complete schedule is available at lrsc.edu. 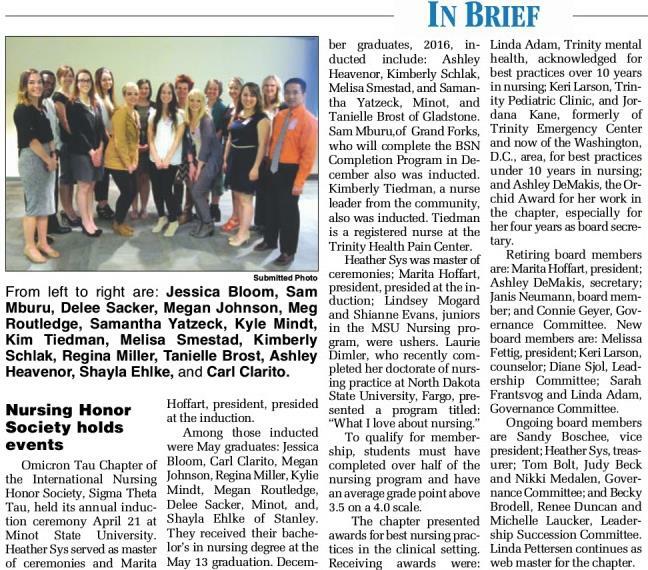 MaSU’s RN-to-BSN nursing program has received full accreditation from the Commission on Collegiate Nursing Education (CCNE). Official notice was received May 31, 2016, and the accreditation effective date is Nov. 16, 2015, extending to June 30, 2021. MaSU’s RN-to-BSN nursing program was established in an effort to assist with the severe shortage of nursing professionals. MaSU will receive $1,902,132 annually from the U.S. Department of Health and Human Services for the next five years to support Head Start and Early Head Start programs. MaSU Child Development Programs provides collaborative programming to meet the changing needs of families across the rural service area of Traill, Steele, Nelson, and Grand Forks counties in eastern North Dakota. Teachers and students can pursue learning opportunities in STEM (Science, Technology, Engineering, and Mathematics) at MaSU during the month of June. Activities are geared at enhancing STEM knowledge for K-12 teachers, as well as college students pursuing early childhood degrees, and early learners, age kindergarten through grade three. “Godspell,” the first of four plays, kicked off MiSU’s Summer Theatre 51st season. Other productions are “Schoolhouse Rock Live!” June 17-21, “Noises Off,” June 28-July 2 and “Oklahoma,” July 13-17. Comprised of community members and MiSU students, faculty and staff, the company annually performs for over 10,000 attendees. MiSU was re-accredited with the CEO Cancer Gold Standard™ certification. This recognition shows the university’s continued commitment to the health of Minot State employees and family members, by certifying MiSU’s efforts to meet an exceptionally high standard of cancer prevention, screening and care guidelines. NDSCS has received The College of Tomorrow award from the John Deere Company. The award serves as a ranking system for the 16 colleges in the United States that offer a John Deere Tech program. NDSCS received the highest ranking of Platinum for the second consecutive year. In 2014, the College received the second highest ranking of Gold. The North Dakota State College of Science Auto Body Repair and Refinishing Technology program recently received reaccreditation by the National Automotive Technicians Education Foundation (NATEF). To achieve this coveted recognition, the College’s program underwent rigorous evaluation by NATEF. Nationally accepted standards of excellence in areas such as instruction, facilities and equipment were used. The North Dakota State College of Science has named 383 students to its spring semester 2016 President’s Honor List. The Honor List recognizes students who have achieved grade point averages of 3.5 or higher while taking at least 12 credit hours. A new endowed chair at NDSU will galvanize the institution’s growing entrepreneurial culture, thanks to a $4.5 endowment, which includes $1.5 million from the Higher Education Challenge Fund. The goal of the endowed chair is to nurture faculty excellence in entrepreneurship education and to encourage students to pursue big ideas and innovative thinking and activity. NDSU was one of 28 engineering programs to be accepted into the National Academy of Engineering Grand Challenge Scholars Program. Up to 20 students per year will be selected for the program, which provides specialized preparation for taking leadership in solving the toughest engineering issues facing society. NDSU hosts many summer programs, such as North Dakota Governor’s Schools and STEM Bootcamp, that give the state’s students access to hands-on learning experiences and exposure to career options. The summer programs are another way NDSU helps the state’s youth prepare for future education and careers. The University of North Dakota College of Engineering & Mines researchers were recognized for Technological Advancement on June 7 at the Geothermal Energy Association Honors 2016 in Reno, Nev., for launching the first commercial project co-producing geothermal power from an oil and gas well. The facility started generating electricity for the first time in late April. University of North Dakota Entrepreneurship and Chinese Studies major Sol Eagle Road has been awarded the prestigious Udall Foundation Undergraduate Scholarship to promote studies in tribal public policy and Native healthcare. Winners receive $7,000 awards for their junior or senior year of college and a mentoring experience. The University of North Dakota recently competed with more than 50 universities in NASA’s Robotics Competition at Kennedy Space Center in Florida. UND took first in “public outreach” and second in “presentation and demonstration.” UND placed fifth overall. The objective was to build a robot capable of mining Martian soil. The teacher preparation programs at VCSU have been reaccredited under the National Council for Accreditation of Teacher Education (NCATE) standards at both the initial teacher preparation and advanced preparation levels. The NCATE standards are administered by the Council for Accreditation of Educator Preparation (CAEP). The recommendation to continue VCSU’s NCATE accreditation was approved by CAEP’s Selected Improvement Commission at its April 30–May 3, 2016, meeting in Baltimore, Md. “Special congratulations are in order because the Commission cited no areas for improvement relative to any of the standards,” said Christopher Koch, CAEP president, in a May 17, 2016, letter to VCSU President Tisa Mason conveying the reaccreditation news. The university now offers bachelor’s degrees in elementary education and in secondary education in the following areas: art, biology, business, chemistry, English, health, history, mathematics, music, physical education, social science, and technology. VCSU also offers a master’s degree in education. VCSU freshman Seri Geisler won the national title in women’s javelin at the NAIA Outdoor Track and Field National Championships in Gulf Shores, Ala., on May 26. Geisler’s career-best throw of 51.37 meters beat the second place by more than two meters. A native of Grand Rapids, Minn., Geisler entered the meet with the top throw in the nation—50.20 meters—by more than three meters. In her first season ever throwing javelin, she set a VCSU school record and won conference and national titles. The Interim Higher Education Committee of the North Dakota Legislature met on the VCSU campus Tuesday– Wednesday, June 7–8. Included on the agenda were presentations and committee discussion regarding higher education budget issues, student financial assistance programs, the North Dakota University System (NDUS) campus master plan and space utilization study, and potential legislation to be recommended by the committee, along with updates on issues affecting VCSU. Chaired by Representative Mark Sanford of Grand Forks, the Interim Higher Education Committee heard from several NDUS administrators, including Chancellor Mark Hagerott; Tammy Dolan, chief financial officer; Rick Tonder, director of facilities planning; and Lisa Feldner, vice chancellor for information technology and institutional research, and interim chief of staff. VCSU presenters included President Tisa Mason; Peter Smithhisler, vice president for student affairs; and Julee Russell, professor of English. Russell presented on VCSU’s new three-year programs, which allow undergraduates to complete bachelor’s degrees in three years in business administration, elementary education, English education, mathematics education, and professional communication. Higher Education Committee members were also shown the construction work being done on the Valley City flood wall in front of Foss Hall, and offered tours of the Gaukler Family Wellness, Health and Physical Education Center, opening this fall. At an evening reception, area K–12 teachers working with the Great Plains STEM Education Center at VCSU presented some of the hands-on activities they are using to engage their students. Alan Billehus and Jason Mathers completed 40 hours of training to be certified HAZWOPER (Hazardous Waste Operations and Emergency Response) instructors. Michael Hampton University of Utah School of Medicine and Rocky Mountain Center for Occupational Environmental Health conducted the training at TrainND’s new training facility December 14 -18, 2015. Jabrie Bullard and Jeremy Ruffin, both players on Williston State College’s men’s basketball team, were awarded Certificates of Achievement from Assessment and Learning in Knowledge Spaces (ALEKS) this May after completing their first year at WSC. ALEKS is software that designs a course shell for students based on their initial assessment taken at the start of the course. Course shells provide each student a successful learning path with positive reinforcement along the way. Students are able to learn the material at a rate that works best for them. Funded through the Title III Grant established in 2012, ALEKS was listed as a choice in the grant to improve the retention rate from developmental mathematics courses through college algebra. Williston State College Foundation (WSCF) is restarting its Alumni Association, bringing back WSC alum, Hunter Berg, to become as WSCF’s Alumni Association Director in July. With its goal to provide a database for WSC alum and keep past students up-to-date with current events at the college, the WSC Alumni Association is something that has needed updating and attention. A longtime goal of the Foundation the Alumni Association has been patterned after several other colleges in the state and region. The State Board of Higher Education took steps to finalize its budget June 16-17 when it met for its annual retreat and budget meeting. Thursday’s strategy session saw a wealth of details as members of the chancellor’s cabinet presented findings on six studies that have been underway for some time. Those studies – Administrative Costs, Governance, Mission, Retention, Shared Services and Tuition – provided details for the future of higher education. Paired with findings from the Envision 2030 educational summit, the studies provided the North Dakota University System and Board members a more defined path forward as the afternoon session progressed. Involved discussion on strategy continued Friday morning as the Board’s annual meeting kicked off with a presentation from a local executive and author, who focused on the need to utilize technology now more than ever in fostering success in a younger workforce. Vern Dosch, CEO of NISC, presented on millennials and technology. Vern Dosch, CEO of the National Information Solutions Cooperative, presented on culture, millennials and technology as noted in his book, “Wired Differently.” During the presentation, he encouraged the university system to both embrace how millennials worked, as well as how technology could be, and was, the driving force for that change. He expanded on the ‘servant leadership’ outlook – that the notion of serving others was key, and when paired with humility, would create a successful leader. Dosch drew comparisons between his private sector work as CEO of a cooperative and the public sector work of campus or system leadership, and how both types of leaders “serve many masters.” He expanded on the idea that collaboration was key – not just in working with those who might be considered competitors, but in listening to team members and leadership in top-down and bottom-up approaches. Highlighting an example of NISC’s transition from being a regional service company to an international company? through a merger that brought different cultures together. People who had been competing for years were asked to “take those swords and make them into plowshares.” The result, he said, was a once cash-strapped company that grew from 300 employees, 350 customers and 15 percent equity in 1990 to a 1,300-employee, 55-percent equity organization serving 750 customers, that is able to utilize cash flow to pay for infrastructural and system costs today. “That was because our board saw that our business model was broken, and that we needed to change it to fit with the needs of the times and grow,” Dosch said, noting that the university system and higher education could now find itself in a place to do the same. Doing so would increase system output – high-quality students. Jim Kelly, executive director of the Theodore Rooselvelt Presidential Library Foundation, described details of the Teddy Roosevelt Presidential Library. Jim Kelly, executive director of the Theodore Roosevelt Presidential Library Foundation, presented the Board with details of the Theodore Roosevelt Presidential Library to be located on the Dickinson State University campus. A 99-year ground lease agreement with DSU would give the 55,000 to 60,000 square foot facility a construction site of about 28 acres at the current DSU rodeo grounds, which were already planned for relocation to south Dickinson. Kelly said that the foundation was creating a team of construction developers to detail plans and funding. He noted that projected funding would include $12 million from the N.D. Legislature, $3 million from the city of Dickinson, and with an additional $5 million made available conditionally. He noted that the organization would seek another $5 million from the state. Proposed site construction would total $55 million with another $15 million needed for interior exhibits. The foundation would also seek to set up two endowments of $15 million each for ongoing operations. Kelly said the facility would be open to the public and allow for all types of public events, with a “strong connectivity to Dickinson State University.” He added that a working library and museum would be the main attractions of the facility, and access to digital libraries would also be available. After further discussion with more input from Kelly and DSU President Tom Mitzel, the Board voted unanimously to approve the agreement. SBHE Chair Kathy Neset and Vice Chair Don Morton hear details of the budget request. During budget talks, the Board delved into discussion of budget implications from the prior day’s Board retreat, and needs for the system office, campuses and forest service, State Board of Agricultural Research and Education, Upper Great Plains Transportation Institute, and Northern Crops Institute. Chief Financial Officer Tammy Dolan reported on the system office, campus and forest service needs. NDSU President Dean Bresciani and the UGPTI, SBARE, and NCI heads spoke to the other budget agenda items. In her report, Dolan noted a decrease of nearly $62 million, which fully complies with the 10-percent reduction guidelines recommended by Gov. Jack Dalrymple. She said the amount included completed student credit hour production, which generated an $11 million increase for the campuses. Brief discussion touched on employee raises, and how those would be determined after the governor makes his recommendation. Detailed conversation followed, including questions concerning the formula, salaries and necessary timelines for budgets. Dolan explained the base budget request, the optional base budget requests, and one-time requests including capital projects. Rick Tonder also spoke to the Board on how capital projects had been prioritized. Only two projects were recommended by the Board to be added to the budget request. During his report, Hagerott thanked his cabinet for the members’ diligent work on the six studies. He recapped key findings of those studies, including governance, tuition and fees, administrative costs, mission, retention, and shared services. Vice Chair Don Morton brought forward the consent agenda from the Budget, Finance and Facilities Committee. That consent agenda included the NDUS office and SBHE FY17 budget, the authorization for NDSU to proceed with the Walster Hall Lab renovation, the authorization for NDSU to enter into a capital lease agreement, the authorization for NDSU to adopt a new resolution regarding bonds. Each item of the consent agenda items was approved by the Board. Board member Kari Reichert brought forward the recommendations from the Academic and Student Affairs Committee, which included authorizations from Central Michigan, Embry-Riddle, Park University and Rasmussen College to operate in North Dakota in 2016. The recommendations were approved. Neset took a moment near the end of the meeting to thank Interim UND President Ed Schafer for his work. The Board also held its internal election of officers and committee appointments, and presented plaques to its outgoing Board members: Emma Tufte, Eric Murphy, and Brett Johnson. Neset and Morton were both nominated and unanimously approved to continue serving in their current capacities as Chair and Vice Chair, respectively. It also held the second reading of policy 302.2 (audit committee), 802.8 (internal audit charter), and 1202.1 (acceptable use of use of information technology resources). A special meeting to finalize presidential evaluations and salary increases was scheduled for June 29. BSC President Larry Skogen presented details on the Mission study. The State Board of Higher Education took a full day recently to reflect on its ongoing efforts to shape the vision of the North Dakota University System. During the Board’s annual strategic retreat held earlier this month, members heard updates on several studies from the Chancellor’s Cabinet, talked self-assessment, reviewed results from the Envision 2030 educational summit, and discussed the importance of having a sound governance model. The morning’s studies were kicked off by Bismarck State College President Larry C. Skogen, who spoke on the study regarding Missions. Skogen said that the study was based on a five-year trend from statistical analysis from each institution. The study was based around the question of whether or not the state’s economic, education and workforce needs were being met by the current structure of and program delivery of the system and its institutions. Taking into account historical background of the system and those institutions, and the current trends in statewide demographics, Skogen said that under the statewide analysis, certain needs were found to have been met, but others, such as those providing enough K-12 teachers, were falling short. Throughout varied regions in the state, agriculture remained a high priority, and education with technology also trending higher as a regional priority. Skogen concluded that education and training needs differed throughout the state, as did the employee pools in regions and from rural to urban areas. Surveys indicated that while six four-year degree-granting institutions comprised 77 percent of the study body, there was a need in the western part of the state for more four-year programs. He noted that the five two-year degree-granting institutions that made up 23 percent of enrollment could be expanded to help meet the changing needs of the workforce, which was increasingly looking for employees in the medical and skilled trades. “We need to have a stronger connection between elementary, secondary, higher ed, business and industry so that students understand what is available out there,” Skogen said. Mayville State University President Gary Hagen spoke to the Board next, providing them details on the Retention study. Hagen began by noting that the committee looked to find gains in retention and graduation rates through successful implementation of the Predictive Analytics Framework, ensuring appropriate retention and graduation metrics to ensure continuous improvement, reporting progress and challenges the system office and Board, and providing ad-hoc committee oversight as needed. Hagen said that in recent years, focus throughout the nation has shifted away from access and enrollment to outcomes such as retention and completion rates. Retention rates were relatively new to higher education, but funding had been provided by the N.D. Legislature to implement PAR and early intervention tools like Starfish, both of which helped drive methodologies to increase positive outcomes at NDUS institutions already. He continued, noting that campuses were set to accelerate retention rates by sharing best practices before the Fall 2016 semester begins. The collaborative efforts would quickly assist retention needs and culminate in a year-end report that would detail statistics, implementation progress, student improvement activities, summary of campus organizational and structural changes, and major concerns and accomplishments. NDUS Chief of Staff and Vice Chancellor for Institutional Research and Informational Technology Lisa Feldner provided findings on the Administrative Cost study. Feldner introduced the study with the current best breakdown across campuses of students and employees in the following areas: academic administration, academic disciplines, athletics, external affairs, information technology, institutional and business affairs, physical plant, student affairs, and research. Feldner compared system data against national averages, and listed industry-banded job families that provided a further breakdown of similar positions throughout the 11 public colleges and universities. She stated that certain job counts by banded job families remained to be completed. A salary market study compared N.D salaries to those elsewhere. Minot State University President Steve Shirley provided details for the Shared Services study next, noting that a number of initiatives were already in place throughout the system. He noted that systemwide collaboration was underway for topics relating to Learning Management Systems, procurement, library databases and more. Regional collaborations were also being considered that would create “hub” approaches where the largest institution in a given region would serve the needs of one-to-three smaller area campuses for responsibilities such as internal audit, Title IX, international students, and more. Feldner said that other opportunities for collaboration existed in expansion of current practices, such as shifting video/audio conferencing to ND ITD this year, processing payroll more centrally or as expanded regional approaches, possibly expanding the institutional research model currently in place at BSC, NDUS and University of North Dakota, and more. North Dakota State College of Science President John Richman gave the study on Tuition and Fees next, first noting that the current cost-based funding model per student had been put in place by the 2013 Legislative Session. At that time the approved funding for base appropriations was done using a three-tiered approach for two-year colleges, four-year universities and research institutions with a goal of equalizing Student Credit Hour funding within each institutional tier by 2015, which was achieved. Richman compared tuition and fees, and their descriptions, between North Dakota, Minnesota, South Dakota, Montana, Oregon, Tennessee, Colorado, Maine and Wyoming, and against assistance provided for in-state and non-residents. Richman added the potential impact to each institution, should the model change. Valley City State University President Tisa Mason provided the last of the Cabinet studies, on governance. She noted that effective governance included creating a culture that enabled high levels of trust and flexibility in accomplishing work and making timely and responsive decisions. Doing so would be facilitated with focus on oversight, insight, and foresight. Mason found that using a self-study based on an article from the Association of Governing Boards indicated that there was a balance for any governing board in holding authority and wielding it judiciously. Furthermore, the system and the Board must serve the state, citizens, and students, while at the same time providing autonomy for each institution. Recommendations moving forward would be to review the assessment processes and procedures for the presidents, chancellor and the Board. Chancellor Mark Hagerott presented system findings on the recent Envision 2030 summit on education. Reiterating discussion points from the days’ speakers, he focused on summarized goals found during the breakout sessions on nine topics as they related to higher ed and the needs of the future. After discussion surrounding the day’s proceedings, and accompanying handouts, the session facilitator asked attendees to write down their thoughts on how to align breakout session ideas with the Board’s strategic plan. Single out areas of focus and invest in them. Leverage small size for higher quality. Recognize that providing needed programs may not equal 4- and 6-year graduation rate goals. University of North Dakota’s 10-year plan to become an AAU member. Increasing automation requiring fewer employees. Board member Kari Reichert spoke about the purposes of assessment during the afternoon session. She said that many details on the topic were presented at a meeting of the Association of Governing Boards. Among the points made regarding the purposes of assessment were fiduciary duty, fulfilling requirements of accreditation, contributing to collaborative strategic leadership, creating an opportunity to develop plans and actions that increase the effectiveness of a president’s work, expanding the board’s knowledge of president’s work, and providing insights on governance effectiveness. Later, Vice Chancellor of Strategic Engagement Linda Donlin opened up the Board’s self-assessment portion of the meeting. She noted that the Board self-assessment was vital to successful Board function and was equally important to the Higher Learning Commission. The last self-assessment was done in 2014. The current self-assessment used that same framework. Using the previous self-assessment as a baseline, Donlin was able to provide side-by-side comparisons of where the Board was in 2014 and where it stood today. Numerous areas showed significant growth by the Board and its vision for the system. Some areas highlighted that growth by noting successful completion of previous goals allowed the Board to focus on working toward new ones. Some accomplishments, such as implementing of the five-year strategic plan and reinstituting committees, had been instrumental in moving the Board’s mission forward. The self-assessment was split into varied sections, including biggest issues facing North Dakota, the most important challenges facing NDUS, what Board practices should be enacted or discontinued, the Board’s top accomplishments and top issues to be addressed. The following is a roundup of news on North Dakota University System’s 11 public colleges and universities for the week ending Friday, June 24. Small-Business Savvy: Who should your first customer be? A proposed two-stage plant is moving closer to generating heat, and revenue, at Valley City State University. After a detailed presentation on the plant to the State Board of Higher Education at its April meeting, VCSU’s combined heat and carbon production system is gaining steam on its way to producing much of the same. On the way it’s also serving as an educational tool. The proposed activated carbon plant began in 2008 as a concept for integrating carbon production with steam plants. Later, the concept was applied to the VCSU steam plant project, although only the steam plant project has been finalized and approved. According to Wesley Wintch, VCSU’s vice president for business affairs, the reason it began was the need to decrease the cost of production of activated carbon. To achieve that end, the plant is fueled be either lignite coal or some form of biomass – both readily available in North Dakota. Once the need for a heating plant came up on campus, Wintch said it was a natural fit to do a joint project. From there, partnership opportunities with the University of North Dakota’s Institute for Energy Studies and Energy and Environmental Research Center seemed like a natural fit. A UND student group was added this year as two UND faculty – Steve Benson and Michael Mann – felt its inclusion would be a great opportunity for engineering students. “The students have been on campus and done a fabulous job explaining, diagramming and projecting expenses for this activated carbon plant,” Wintch added. He noted that in addition to serving VCSU’s heating needs, the combined facility will also serve as a one-of-a-kind research opportunity that fits well into the university system’s top priority of education. Mann, the UND distinguished professor of chemical engineering, and executive director of the IES, served as the technical advisor to the student group as it worked through its work on the plant, which also served as the group’s capstone project. He noted that UND had been working with the NDUS on the concept for years. “It is based upon a technology developed at UND in conjunction with a small business (Envergex) that is a partner in a number of our projects,” he said. “A preliminary study was performed using UND as a case study to determine if the concept was feasible. Since the answer was yes, the next step is to look at the process in more detail. At the next level of detail more attention was given to the details of the design and obtaining better cost estimations. Those details came from the students’ work. Mann said the group’s scope included a preliminary design of the process including the sizing and selection of potential plant equipment, determinations on plant economics, and plant layout options. The students also looked into alternatives, and economic sensitivity to changing market conditions. The learning experience for the students will give tomorrow’s researchers something to learn, as well. “The combined carbon/heat plants are unique and will educate the energy and environmental experts of tomorrow, who together with today’s research scientists will develop the gateway technologies that may become the most important energy advancements of this century,” Wintch said. Currently, the system exists as two plants. One side is dedicated as the heating plant, which will provide steam heat to the campus. The other plant is the activated carbon plant, which will connect to the heat plant and be used to produce activated carbons. Those activated carbons can be used for numerous products ranging from infrastructural to filtration systems. A third plant focused on producing power has been explored, but not formalized. Wintch noted that the school was actively looking for external funding, including grants and business partners, to help cover those costs. The “cost savings” of the plant will come in its ability to generate revenue as it generates steam heat. According to Wintch, the operation of the plant is projected to create revenues “above and beyond” its expenses. He added that two types of carbons could be produced that include activated carbon for gas and water purification and specialty carbons used for energy storage. Steve Benson, professor at the IES and associate vice president for research at the EERC, explained that the process involves heating coal with low levels of oxygen to produce a hydrogen-rich gas and a carbon-rich material called char. Planners have noted that the successful operation of the combined heat and carbon production system could be a boon for other steam plants throughout the university system. As those other systems age, the potential would now exist for them to be replaced or modified into a facility similar to the one planned for VCSU. Wintch stated that doing so could provide a revenue-generating facility with the ability to pay for itself, and in the long term generate revenue that could be used for other institutional needs including maintenance. Wintch said the much of the timetable is dependent on securing funding for the carbon plant operation. Bismarck State College, Dickinson State University, Lake Region State College, Mayville State University, North Dakota State College of Science, North Dakota State University, University of North Dakota, and Valley City State University received a total of more than $5.2 million in funding through a process set up by the N.D. Legislature in 2013. State Board of Higher Education Chair Kathleen Neset said the funding was vital to the longevity of endowments and scholarship programs throughout the North Dakota University System’s campuses. This is the sixth round of awards for the 15-17 biennium, which must meet needs within four categories: education infrastructure, endowed chairs, scholarships and technology. The announcement brings the total awarded to over $14 million, out of more than $22.6 million set aside for this purpose by the legislature as matching funds. Under the grant process, the Challenge Fund Grant Review Committee awards one dollar in matching grants for every two dollars of non-state, non-federal funding raised by the institutional foundations. Bismarck State College: $75,086.13 for a scholarship endowment. Dickinson State University: $303,080.83 for endowments and scholarships. Lake Region State College: $1000,000 for endowments. Mayville State University: $33,719.82 for scholarships. North Dakota State College of Science: $45,000 for endowments and scholarships. North Dakota State University: $3,459,862.82 for endowments, scholarships, and a student support initiative. University of North Dakota: $432,700 for scholarship and faculty endowments. Valley City State University: $750,656.33 for an endowed scholarship. Earlier this year, Dickinson State University, Lake Region State College, Minot State University, North Dakota State College of Science, North Dakota State University, University of North Dakota and Williston State College received financial awards through the Challenge Fund. 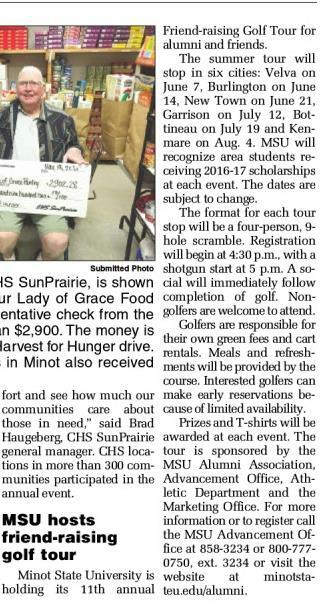 For more information, check out the previous grants story posted here. The following is a roundup of news on North Dakota University System’s 11 public colleges and universities for the week ending Friday, June 10. The following is a roundup of news on North Dakota University System’s 11 public colleges and universities for the week ending Friday, June 3.